Ellen Kellaway, was alone in the world when she was just five years-old. Her mother’s wealthy cousins took her in, and raised her alongside their own daughter, Esme. But they never let her forget that her every advantage was owed to the charity of others. And that while Esme was destined for a great marriage, she would have to go out into the world when she came of age, and earn her living as a governess. Ellen didn’t like that at all. She appreciated what was being done for her, but she had no intention of being a governess. She knew that the world had far more to offer. I loved Ellen from the start. She was bright, warm, caring and she had such a wonderful spirit. The perfect heroine to follow into a grand adventure. I wasn’t quite sure what year we were in, but I’d hazard a guess at late Victorian or early Edwardian. Whenever it was, Victoria Holt painted her world – the escapades, the houses, the clothes, the parties – quite beautifully. Ellen was saved from life as a governess when the son of a powerful London family asks for her hand in marriage. It cause consternation at home, because he had been seen as a likely prospect for Esme, but Esme dreamed of a simple, quieter life and she was happy for her cousin. Only a third of the book was over though, and so I suspected this would not be Ellen’s happy ending. It wasn’t. A terrible tragedy, days before her wedding, left her alone in the world again. This time her father’s family came to the rescue. Ellen discovered that her father wasn’t long dead, he had died just weeks ago, and he had appointed his cousin, Jago Kellaway. Jago’s invitation to a family home she had never known, a castle on an island couldn’t have come at a better time. Ellen falls in love with the Far Island, and with its Lord. But she is troubled, plagued by questions and doubts. Why will nobody tell her anything about her father? Why did her mother leave? Why does so much of her new world seem so familiar? Who was Silva, her half-sister who had been raised on the but was now missing, presumed dead? Is Ellen just accident prone or does somebody wish her harm? It was a grand mystery, and Victoria Holt does Cornwall wonderfully well. The mediaeval castle, the island, the sea, the surrounding countryside all came to life, and I found it so easy to understand why Ellen fell head over heels in love with the place. Sadly the plot and the structure were a little clunky. I knew that the main drama would happen in Cornwall, and the first act in London, even though I loved it, felt over-long and the second act in Cornwall felt a little rushed. And, though the logic of the plot worked it felt a little too improbable. But that’s not to say I wasn’t swept away, by the story, by the mystery, and by the wonderful atmosphere. I’m inclined to say that while Victoria Holt does a very nice line in engaging heroines, and in nice, thoughtful men, she has a less certain touch when it comes to brooding heroes and dastardly villains, who at times seem a little one dimensional. If I sat down and thought about it I would have realised how the pieces of the puzzle must fit together. I didn’t, because I was engrossed. And, even if I had, I think there would have been enough surprises along the way. 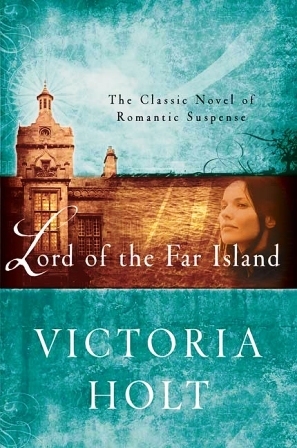 Lord of The Far Island finished with high drama, and just a touch of romance. It wasn’t perfect, but it was a fine entertainment for a cold, dark, winter night. « A Dog Blogs: Answer Time! I haven’t read a Victoria Holt since I was a teenager, but I loved them then. The Jean Plaidy books especially the Plantagenet Saga were fabulously researched and brought history to life for me. Time to revisit I think…thanks for the reminder. Gosh, I loved Victoria Holt as a teenager too – seem to recall borrowing Mistress of Mellyn, The Legend of the Seventh Virgin and The Shivering Sands from my mum! Also was very fond of Evelyn Anthony’s Imperial HIghess – you’ve really brought memories flooding back! Victoria Holt was a writer I read as a teenager too. And absolutely loved. I read her Jean Plaidy books too. I can remember this plot very well. Thanks for reminding me of the book.